My hubby has been out of town for the last few days and aside from missing him terribly, I’ve been busy trying to keep everything running without a hitch—teaching, cleaning, cooking, working, photographing, parenting…there’s a lot to do when you’re a stay at home-working-homeschool mom! Truthfully, I usually get more done when my hubby’s away, because instead of vegging on the couch watching our shows each evening, I resort to doing the things I hate would normally put off, like laundry and housework, eagerly awaiting his homecoming. I made us a special treat on our last night before dad’s return. I mean, I do want to be known as the fun parent every once in a while too…dad shouldn’t get all the credit! The nice thing about this dessert is that it’s made with wholesome ingredients, like avocado, walnuts, dates, and berries. My kids get a special treat and I can feel good about the fact that there’s no additives or artificial sweeteners. It’s truly a win-win situation. Yep, I’d say it was definitely win for us all. These brownie parfaits are full of healthy ingredients and both vegan and paleo friendly! Great snack or dessert and free of gluten, grains, dairy, and refined sugars! Place walnuts and dates into a food processor and pulse until mixture is crumbly. Add cocoa powder and pinch of salt and continue to process until mixture is thoroughly combined and begins to hold together when pressed. Pour mixture into a small pan (I used a bread pan) lined with parchment paper, and press evenly into the pan. Cover and refrigerate while you're making the other parts of the recipe. When you're ready to use the brownies, remove from the pan and cut into bite-sized chunks. Rinse out your processor and add avocados, ⅓ cup maple syrup, 3 tablespoons cocoa powder, coconut oil, vanilla, and a pinch of salt. Blend until creamy and smooth. Taste and add extra sweetener or cocoa powder to suit your taste. Cover and refrigerate until ready to use. The cream cheese is optional, but if you have decided to use it, place it into a mixing bowl and beat until creamy. Open cold cans of coconut milk and discard any liquid. Place the firm coconut cream into the mixing bowl with the cream cheese and beat together with the mixer until well blended. Add sweetener and continue to beat until fluffy. Cover and refrigerate until ready to use. Whisk maple syrup and cocoa together in a medium bowl. Mix in vanilla. If mixture is too thick, stir in a splash of water to thin. If too thin, blend in a bit more cocoa powder until it reaches desired consistency. This is what heaven looks like, right? I need this parfait in my life! This looks amazing!! I need it in my life! Haha, they were so good! Thanks Desiree! This looks divine! Your photography is amazing and the recipe is begging to be eaten! :). So yummy! Pinning now. Thank you for your encouragement and kind words, Angie! I love, love, love this! It looks delicious and decadent and I’m so excited that it’s vegan, Pinning this for future use! Thank you for pinning Kwame! Have a wonderful weekend! This looks really good 🙂 might try this out soon! Ok so your pictures are to die for!!! Seriously, this looks soooo yummy! This could not look more delicious!!!! And GORGEOUS videography. Thank you for your encouragement! Have a nice weekend! 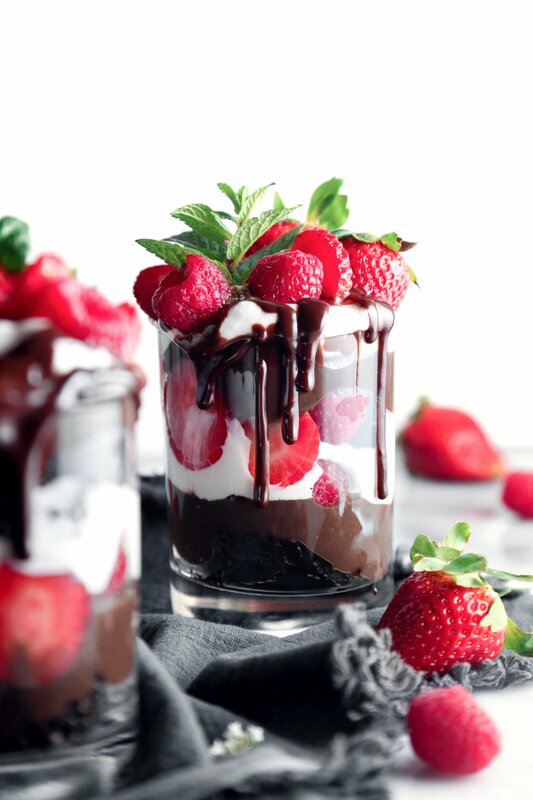 These brownie parfaits sound amazing! I have to try this recipe! It looks so decadent and yet in a healthy way! Yummy Joscelyn! and as usual you know I love your pics so! Aw, thank you Amisha! They were delicious and honestly don’t taste “healthy”! In a good way though, haha! Appreciate your kind words as always my friend!! oh yum! Seriously this all my favorite things into one dessert! A GF and vegan brownie parfait! I am ALL for it. Looks absolutely delicious. Aw thanks Jessica! You’re so sweet. Have a great weekend! This looks amazing! Of course, you really can’t go wrong with brownies. Wow, that looks absolutely amazing! That’s probably the best looking vegan dessert I’ve laid eyes on. I love would love to give this recipe a try. WHOA. This looks AMAZING! I can’t wait to try this – ASAP. Aw thank you Amanda! I hope you’re having a great day!